Abraham Maslow wrote a paper in 1943 entitled The Theory of Human Motivation. The most famous portion of the work was his Hierarchy of Needs. As you may know, it covered everything from our basic requirements for food and shelter to safety, self-esteem, morality, health, self actualization and one aspect that I find fascinating which is our desire to belong. It is the reason we have clubs, teams, communities and networks. We need each other for commerce and business but we also need each other to converse and create, build and share. It is the essence of social networking which has been around for a couple of hundred million years. While attending SobCon earlier this year, I noticed a shift in the tone of the discussions. It was not a room full of web geeks; it was an astute group of smart established business professionals. Sure, many of us met online but that’s where the conversation began. It was a conduit at best. I was smiling yesterday as I read some positive comments about BlogWorld happening in Vegas this week and some even shocked about the professionalism of the speakers and presentations. Perhaps this is because we believe the online tools will help move the revenue line but still surprised that it really is doing that. But SobCon and BlogWorld or any other convention is irrelevant without the people and our need to belong. You don’t get excited that you’re going to the game this weekend so you can sit by yourself, you are going to share an experience with others – in some cases, thousands of others. 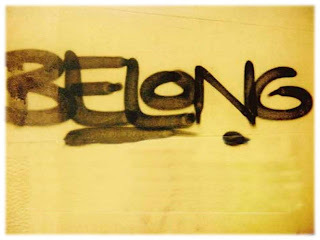 Our need to belong is wired into our collective DNA. Don’t believe me? Remove all contact with humans for 24 hours. No contact! No email. No Internet. No phone. No tweets. No TV. No radio. No wireless device. Nothing. The entire reason 33 miners were pulled out of an apartment sized hole in the earth a mile down was their ability to be a community. They longed to survive together. How can you embrace our inherent need to belong in your business?